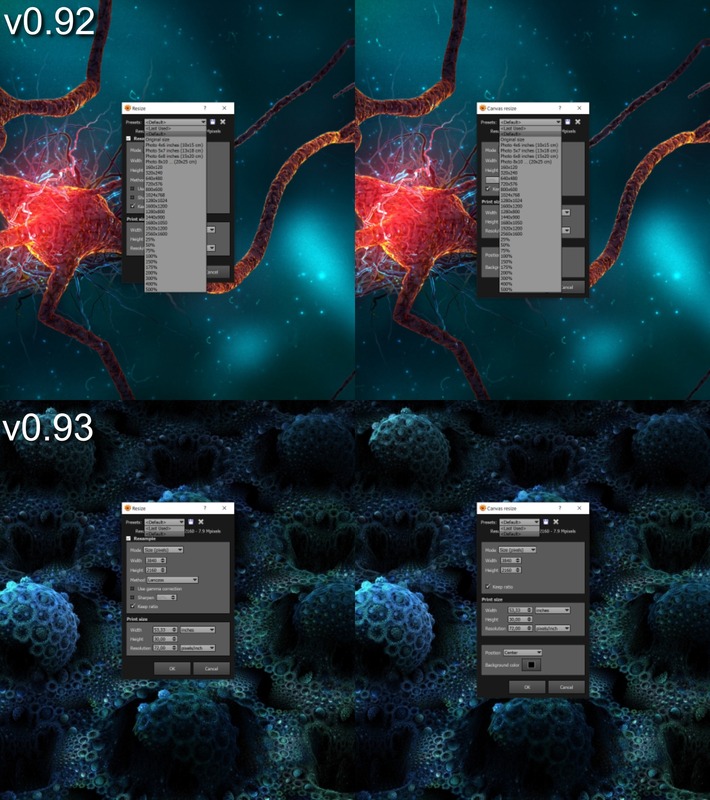 The Image resize (Shift+S) and Canvas resize (Shift+C) dialogs of v0.93 do not offer any presets to chose from, as opposed to v0.92 and earlier versions. Last edited by deus-ex on Sat Feb 02, 2019 9:07 am, edited 1 time in total. do you have used .zip or .exe package? DO you have the ResizePreset.xt file in XnView folder? For further verification of the missing presets issue I deleted my local xnview.ini (I choose the strategy to save XnVieMP's settings to an ini file located in the XnViewMP installation folder) and restarted XnViewMP, but also with a fresh xnview.ini the presets do not show up. Has there something changed with v0.93 regarding the storage of the preset settings? I can try to do a reinstall of XnViewMP using the installer (without manual interference) to see whether this fixes the issue. EDIT: corrected the description of my update process. Last edited by deus-ex on Sat Feb 02, 2019 9:03 am, edited 2 times in total. Do you have any suggestions how I should proceed or what to try? It seems that this file is missing from package, i've updated them. Please download it again? ah, so it initially was missing from the distribution, therefor I could not notice it of course. I just had re-downloaded both the ZIP archive and the installer a couple minutes ago. Copying the file ResizePresets.txt into my XnVieMP installation folder fixes the issue, now the presets are available.